The turbulence of gigantic ocean waves is an overwhelming display of what we call dynamic complexity – a theme that was dear to OUBEYs heart ever since the 1970s and which we continually encounter in his paintings in a variety of guises. So how would it be, I asked myself one day, if people other than scientists dealing on the theoretical level with the power of waves and the interplay of chaos and order in the universe, were to encounter one of OUBEYs paintings. How would it be, for instance, if a Giant Wave Surfer, who had direct physical and mental experience of the tremendous power of ocean waves in interplay with his extreme and hazardous sport were to encounter a painting by OUBEY that in its own manner was the expression of a spiritual reckoning with the stupendous power of such waves. Up to that point it was mainly scientists, researchers, philosophers and artists in other disciplines who had agreed to encounter one of OUBEYs paintings they had never seen before in front of running cameras. With the German Giant Wave Surfer Robby Seeger, who had moved to Maui on Hawaii at the age of 15 to ride its giant waves and had lived there for over twenty years living out his passion, a totally new perspective came into play. It took a while for me to find the right painting to bring to Maui and show to Robby Seeger. 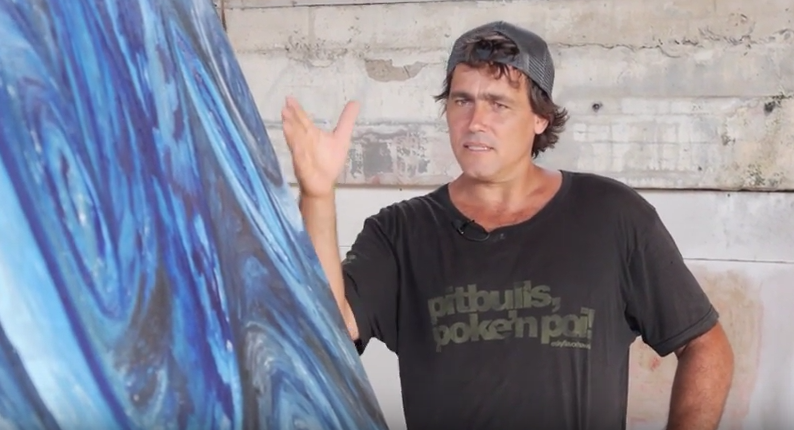 My choice hit on a large blue “wave painting” and if I was so hesitant this was because I feared it might be a little too apparent in its subject matter for an encounter with a Giant Wave Surfer. 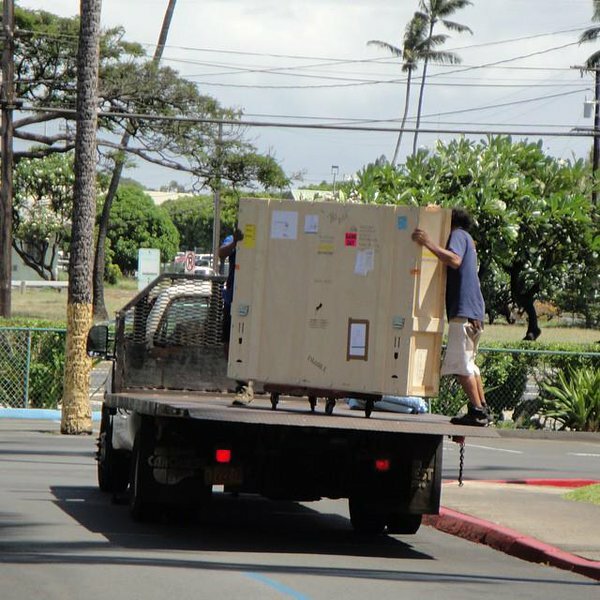 It was the largest of OUBEYs paintings I had ever taken on a journey round the world and I had to commission a new transport crate big enough for the dimensions of the painting to have it flown to Hawaii. Robby Seeger´s encounter with this painting was singularly intensive – for me too. On the one hand because he kept searching for his own particular point of physical entry to the painting, finally finding it in an oblique side view perspective. This astonished me but it isn’t really surprising when you consider that a surfer always glides along the inside of a wave at an oblique angle deriving a feeling of peace as Robby Seeger himself puts it in the encounter. And on the other hand because this encounter also touches on the relationship between the human and the natural force of the ocean right through to questions of life and death. At the end of the Encounter Robby Seeger stated that the whole experience had been “a little bit of magic” for him. “OUBEY succeeds in locking energies in his paintings that go far beyond himself and speak to other people, other beings.” OUBEY would certainly have been delighted to hear this. And this time too, like so many before, it was a great pity that these two men were never granted the opportunity to meet one another during OUBEYs lifetime. Even today I still feel a glow of happiness in thinking that this extraordinary Encounter with Robby Seeger actually happened and that I myself personally met him accompanied by one of OUBEYs paintings. Click here to view the video of this Encounter: https://www.mindkiss.com/project/encounters/robby-seeger/. Ist die Mathematik eine Erfindung des menschlichen Gehirns oder existiert sie unabhängig von uns und wir sind nur diejenigen, die ihre Geheimnisse entdecken und ergründen? Wenn man die Qualität eines Kunstwerks durch die Freiheit des Gefühls erlebt und genießt, kann sich die Distanz zwischen Künstler und Außenwelt für diesen Moment der Betrachtung auf einen kleinsten gemeinsamen Nenner verringern. Dass dies auch über größte zeitliche Distanzen hinweg funktionieren kann, ist erstaunlich, aber dennoch möglich. Die „Share&Win“ – Aktion zum OUBEY MINDKISS 5th Anniversary endete gestern Nacht. Wer die Gewinner sind, erfahren Sie jetzt. Gestern Nacht endete die „Share&Win“ Aktion, die zum 5. Jahrestag des Projekt-Launchs von OUBEY MINDKISS in den zurückliegenden drei Wochen im Social Web stattgefunden hat. Vielen Dank an alle, die in dieser Zeit unsere Posts auf Twitter, Facebook oder G+ geteilt oder retweetet haben.